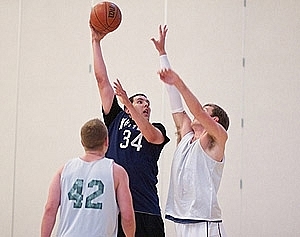 Welcome to The Syracuse Sports Association Basketball Leagues! Basketball sessions run year round! Be sure to sign up early as the leagues normally fill up fast. Leagues are approximately 10 game seasons plus everyone makes playoffs. Games consist of two - 20 minute half's and the clock will stop under two minutes of each half. Depending on the night leagues are either 4 on 4 (8 player max roster size) or 5 on 5 (10 player max roster size). Complete details are in the league descriptions below. Standings and scores will be recorded and updated online each week. Shirts with numbers are required and can be purchase through the SSA team store or on your own. Leagues run year round. Please keep checking in on below for upcoming leagues. All players must be registered on the teams online roster with a valid email, full name and phone number in order to be eligable for league play. For league nights, locations, details and to register a team or as an individual online please see below. To see standings and Schedules of current leagues please click on "schedules & Standings" in the above menu bar.